New customers with Book Learn Pass can take advantage of our great introductory offers in Walthamstow. 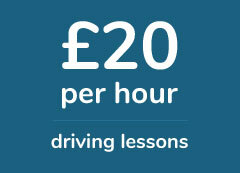 Book 10 or more driving lessons and pay just £20 an hour, saving you up to £40 off the standard fee. Current students can take advantage of some of the most competitive prices in Walthamstow. Our driving lessons are affordable and convenient, we work around your schedule and we offer some of best driving courses in Walthamstow. Prices for current students start at £24 an hour and there are discounts available if you block book your driving lessons in advance. If you urgently need to pass your driving test, we offer crash driving courses in Walthamstow. These intensive driving courses are designed to be completed in a short period of time. Learner drivers who are working to a tight schedule, should consider booking one of the intensive driving courses in Walthamstow listed above. Book driving lessons in Walthamstow with Book Learn Pass today. We have a range of driving lessons available to suit all preferences and needs. Whether you require automatic driving lessons, or a female driving instructor, Book Learn Pass can help you achieve your goals. Our driving instructors in Walthamstow are all fully qualified and we are one of the best driving schools in the Walthamstow area. We have a number of ways you can book driving lessons in Walthamstow. The easiest method is to fill in the contact form at the top of the page. Once complete, a member of our customer service team will call you back to schedule your driving lessons at your earliest convenience. You can also book driving lessons by giving us a call on 07597471607. Our phone lines are open from 8:00am to 9:00pm, Monday to Sunday. Booking your driving lessons over the phone is quick and easy and we aim to have you on the road in no time at all. If you prefer to book your driving lessons in Walthamstow via email, you can do so by emailing bookings@booklearnpass.co.uk. Again our customer service team will respond to your email within a short period of time and it’s one of our most popular contact methods. We have several payment options available. You can pay your driving instructor in cash at the start of your driivng lesson. You can also pay for you driving lessons online via Paypal. If you prefer to pay for your driving lessons by card at the start of your lesson, your driving instructor will have a mobile chip and pin reader to hand to help take payment. As well as covering all of Walthamstow, our driving instructors also operate in much of the surrounding area too. We offer driving lessons in Leyton, Leytonstone and Wanstead, meaning learner drivers throughout the area can book cheap driving lessons with Book Learn Pass. Whether you’re based in Bakers Arms, Leyton High Road, Whipps Cross or Wanstead Flats, you can learn to drive with Book Learn Pass today. Walthamstow is located in the London Borough of Waltham Forest, East London. It’s the largest district in the borough and it has a strong local culture and it’s own vibrant history. It’s home to the longest single street market in Europe and has great transport links to Essex and Central London. The borough of Waltham Forest is estimated to have approximately 271,200 residents and 104,000 households. It’s average median age is below the national average at 34, which suggests more and more young people are choosing to settle down in the borough. There are more than 135,000 working age residents (73.1 per cent) and the employment rate has fallen to 6.4 per cent. Walthamstow is home to the largest outdoor market in all of Europe. It has over 350 pitches and it’s packed full of a range of diverse stalls, shops and businesses. The market stretches from Town Square to St James Street and it’s certainly worth a visit if you are interested in the local culture. The market is open from Tuesday-Friday, 8am-5pm and Saturday, 8am-5.30pm. It’s closed on Sundays and Mondays. Finding the market should not be too much trouble. It is within walking distance of both Walthamstow Central underground station and St James Street national rail station. An independent film house located in the heart of Walthamstow, Stow Film Lounge is one of the town’s best kept secrets. Showing a range of independent films and documentaries, the Stow Film Lounge is one of the best places to visit in the Walthamstow area. Walthamstow is also home to the William Morris Gallery. It is the only gallery of its kind dedicated to the life and legacy of William Morris. William Morris was a designer a craftsman and recognized socialist.